Mother’s Day is fantastic in theory but tricky in practice. First, there’s the problem of glowing tributes to awesome moms everywhere. The tributes aren’t the problem — it’s the discrepancy between those tributes and me. This year on Mother’s Day, my kids heard about moms who make lunches every day for their kids, show love continuously, wake their kids up in the mornings so they won’t be late, are never impatient, understand their kids even when no one else does, never yell, and always stand on the curb waving goodbye. Since I do exactly zero of those things and display exactly zero of those traits on a consistent basis, my guess is that my kids felt a little cheated, and maybe even thought about shopping around a little. I wouldn’t blame them. Next, largely thanks to the mommy media blitz during the first two weeks of May, there was pressure on my kids to come up with gifts that make me cry (ideally, these would be happy tears). My younger kids gave me hand-written coupon booklets that contained, among other fabulous freebies, vouchers for "a big kiss" and a "floor moping," which I’m trying to swap out for a "floor mopping" on the grounds that I’ve heard enough moping for two lifetimes. But hey, a coupon’s a coupon. My older kids — well, let’s just say that not everyone caves under media pressure. So I got a verbal “Happy Mother’s Day,” a grunt that translated into roughly the same message, and an extremely thoughtful gift that I will always treasure. Again, I shed some tears (the mixed emotion kind). And then there’s my poor husband. Talk about pressure. I’m far from the demanding sort, but he loves me and wants to make the day great. As always, he came through with flying colors: flowers, food that I didn’t have to prepare and a hammock for the backyard. Above all, my husband really wanted me to be able to take an uninterrupted nap on my new hammock. I’m still symptomatic from a concussion I received a few months ago in an accident, and I need significantly more sleep than normal. So this nap — in theory — was an excellent idea. But in reality, the weather was gorgeous and the hammock was both large and brand-new. So it only stands to reason that my 7-year-old would join me on the hammock ... and then, a few minutes later, my 10-year-old. 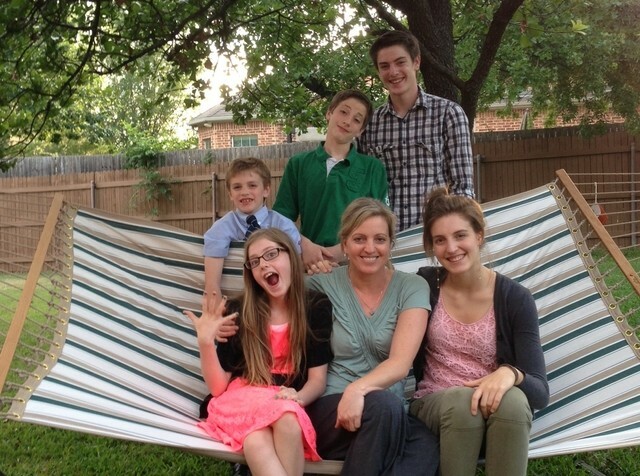 And so on, until all five of my kids were vying for the most comfortable spots on the hammock with me. When my husband saw his plans for my nap being foiled, I knew he wanted to say, “Get off the hammock — it’s Mother’s Day!” But instead, he recognized the moment for what it was, took out his phone and snapped a picture. He’s a keeper. We hung out in the hammock together, my kids and I. Since my nap lasted all of five minutes, it wasn’t ideal; and yet, just like my Mother’s Day that hadn't been perfect, it was perfect. Way too soon there will come a Mother’s Day when I’ll be able to take a completely uninterrupted nap on my hammock. I’m guessing that when I wake up from that nap, I’ll shed a few tears (the melancholy kind). So for now, bring on the interruptions. I’ll be happy to embrace each one of them for as long as I can. I loved this! You are awesome, even when it's not Mother's Day. And PS Tell your kids that my kids make their own lunches too. LOL about the floor moping.